There is a function defined only on SQUARE matrices known as the determinant. It is denoted det(A), and is a Real number. It is found through multiplication and addition of the matrix entries. det(A2 x 2) = product of main diagonal minus product of minor diagonal. 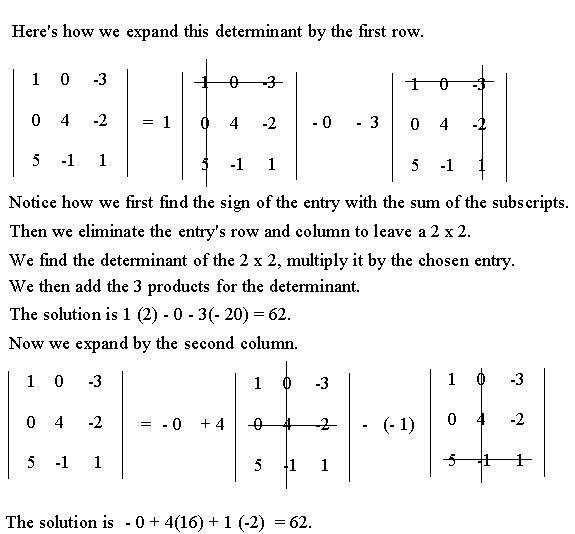 three 2 × 2 determinants, each of which is multiplied by an entry from A.
we can expand by any row or any column. if the sum of its subscripts is odd -- we change the sign. left after we eliminate the column and row of the chosen entry. We expanded the determinant by the first row. Since a11 = 1 and 1 + 1 = 2 is even, we don't change the sign of the entry. so the sum of the subscripts is odd (1 + 2 = 3), we change the sign. In the 3rd step, the entry is a13 so we don't change the sign. Let's do it again but this time we'll expand by the 3rd row. Note: look for rows or columns with 1's and 0's. It makes things easy. 2) The determinant of a triangular matrix = the product of the entries on the main diagonal. 3) If a row of A is multiplied by a non-zero constant k, then det(A) is also multiplied by k.
4) If 2 rows of A are interchanged, det(A) is multiplied by  1. 6) Combining 2 rows of A has no effect on det(A). 7) If A and B are square matrices of the same size, then det(AB) = det(A)det(B). d) det = 0 -- 2 rows are proportional. If A is an invertible square matrix, then the system AX = B has a unique solution. where A1 is the matrix A with its 1st column replaced by the constant column etc. Solve the system using Cramer's rule. We set up the 3 matrices A, A1 and A2 to find their determinants. Cramer's rule works best for 2 × 2 and 3 × 3 matrices. We set up the 4 matrices A, A1 , A2 and A3 to find their determinants. 1) Find each determinant twice. First, expand by a row, second by a column. 1) det(A) = 30. Expand by the 2nd row (it has 2 zeros) and the 1st column. det(B) = 5. Expand by the 1st row and the 1st column.